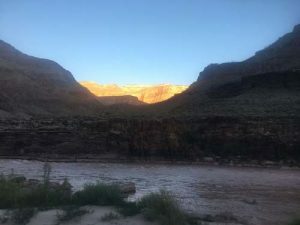 Just a day or two before the end of our two week river rafting trip down The Grand Canyon, a fellow rafter exclaimed to me, “I’m ready to go home, but I’m not ready to leave the Canyon.” I smiled at her appraisal, echoing her evaluation of the sojourn. Yes, the trip was definitely challenging. Indeed, I was ready to swap my sleeping bag and dirty body for a comfy bed and shampooed hair. 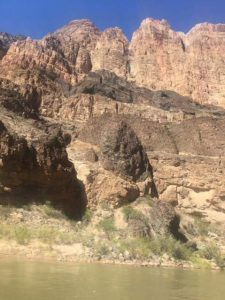 Nevertheless, the serenity, vitality and magic of The Grand Canyon had entered my soul; and these gifts I was not ready or willing to leave behind. I discovered that the trick lies in capturing these tokens and incorporating them into my life once back home. The more I think about it, perhaps that’s the reward and the challenge of a good vacation. The Colorado River Rafting Trip gave me souvenirs that could never be purchased in a general store. Instead, the adventure gave me a new perspective, a new attitude that I brought home with me. Many might think that a rafting trip down the Colorado River is for the young and the fit. No doubt about it, those in peak condition can hike further and higher than this grandma of newborns-to-be through college youth. Nonetheless, I managed with the expert guidance of Arizona Rafting Adventure crew members to scamper up rock cliffs, douse in waterfall pools, and plunge full speed ahead on Class V rapids. In fact, maybe Senior Citizens have an edge over the younger set on a few things the Canyon provides. We can gain life lessons to incorporate into our own lives as well as the privilege to pass on these lessons to future generations. The Grand Canyon, as we experience it today, began its formation between 1 and 1.8 billion years ago. Sand and mud accumulated to an unknown thickness. Heat and pressure intertwined to leave lasting impressions on granite and lava walls. About a week into our trip that began at Lee’s Ferry and ended 225 miles later at Diamond Creek, we stopped for a short hike at a near shoreline amphitheater. Nearby, I could span my arms from rock formation to rock formation. My stretched arm’s length denoted a missing chapter of geological record, one of 1.2 billion years. My mind raced with questions and wonder. I thrilled to be a part of this vast unknown. I greatly relinquished my disposition to acquire all answers. The unknown held power. I left the Canyon a better person, a more serene person, washing away from my mind an obsession to know all in the here and the now. It is okay not to know; in fact, maybe the unknown is part of life’s miracle. No matter the season, the Grand Canyon is a theatre of mystery. River rafting trips begin in springtime. Windy weather promotes clear spells with average high temperatures ranging from 82 degrees F (28 degrees C) in April to 101 degrees F (38 degrees C) in June. Nighttime holds in the warmth, as if shocking any remnants of winter snowfall into expulsion. Summer is hot, especially in July, when daily highs exceed 106 degrees F (41 degrees C). The summer rainy season usually starts in mid-July, bringing much needed rain and cloudy afternoons. Thunderstorms and flash floods decorate August, often providing an orchestra of clashing, powerful sounds. Motorized rafting trips cease on September 15th, diminishing the crowd and making paddlers rejoice. The days become progressively cooler and drier, ranging from average highs in the mid 80’s (29 degrees C). Splashes of 50 degrees F water jolt rafters, no matter the season. The Canyon knows extremes. They categorize the rapids differently, using a ten as a “World Class” rather than a five. One minute we are scouting a level ten of Rapids Lava or Crystal. The next minute we are paddling as if in a placid lake. One hour we are gazing at blue herons and bighorn sheep. The next hour we are shaking out sleeping bags to check for snakes and scorpions. One afternoon we are scaling cliffs of limestone and shale. The next we are viewing miles of flows of golden granite and muddy lava. Vast, unpredictable, and ever changing. Surely, that description fits well The Grand Canyon. Likewise, it fits well life. The Canyon instructs its visitors to embrace the ever-changing nature of life. Once back home, I contemplate this mystery of change. I learn from the Canyon not to shrink from change. It prompts character growth. French author Gustave Flaubert wrote, “Traveling makes one modest—you see what a tiny place you occupy in the world.” It is easy to assume that the Earth is very big and we are, therefore, very small, but it isn’t so obvious from the vantage point of our family room as it is from the bedroom known as The Grand Canyon. Nightly, I shake out my sleeping bag, place it on a rock-secured tarp, and crawl inside. I have no cell phone, television or computer. I have instead dancing stars above me. I recognize many and call them by name. Others are newly met friends. Simply stated, the millions of stars in the sky are suns of different solar systems and galaxies. I learn that the sun is just one of about 200 billion stars found in the Milky Way galaxy. And our galaxy, in turn, is one of millions of galaxies found in a seemingly limitless universe containing more than a billion trillion stars. Math has never been my subject of choice, and these numbers boggle my mind. But their immenseness also comforts me. The night-time beauty surrounds me and instructs me to look for beauty that is present in innumerable places and people. I am taught to take time to find it and rejoice in it once I return back home. 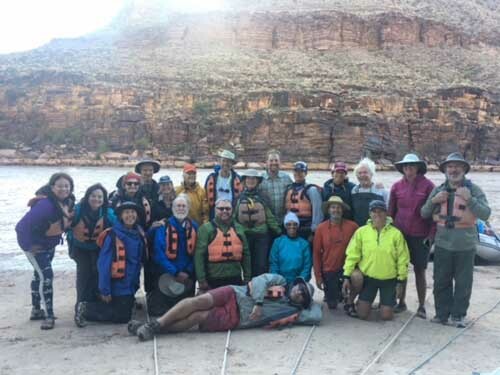 This last lesson was immediately put to the test when we ended our two weeks on the Grand Canyon’s Colorado River. We disembarked at Diamond Creek on Indian Reservation land. 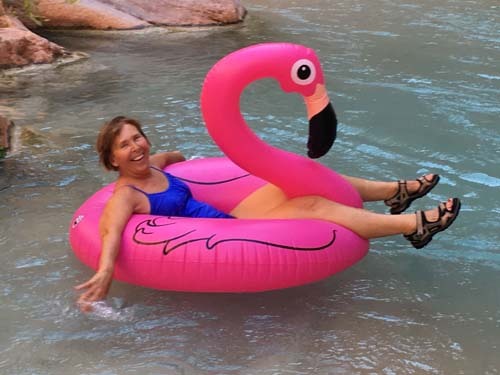 We readied the rafts and equipment for the next Arizona Rafting Adventure’s group, grabbed a quick lunch, and piled into an old school bus in sore need of shocks. About an hour into the ride back to Flagstaff and civilization, we saw flags flying at half-mast. We, of course, had no idea why. We had been immune from so-called civilization. One group member located her cell phone and read about the Las Vegas Massacre. She shook her head. She could not talk about it yet. We were not ready for the calamities of our world. We had bonded as a group of twenty-one rafters, five guides, and two assistants. We knew a world that knew not to harm environment or people. The barrage of horrifying news seemed incomprehensible, and yet it permeated the airwaves and television channels. Rather slowly we entered back into civilization. But we did so with a firm resolve: we would not permit horrors to overpower goodness; we would not allow ugliness to dispel beauty. This lesson alone is reason enough for the trip. This attitude is necessary for survival. To put it mildly, I learned much about The Grand Canyon and about myself during the two weeks adventure. I learned that I could accomplish things beyond the norm. I could lean into the big waves, rise with their power, and lunge forward to safety. I could blend with the wave and let its roar of foam cover me. I could trust my rafting guide, follow his commands, shake off freezing cold water, and reach safety at the end of the rapid. I could welcome quiet time each day, not viewing it as boredom but rather as needed refreshment. I could bond with strangers, sharing in “High Fives” at the end of every victory, rather it be surviving a mighty rapid or traversing a narrow ledge of cliff with a thousand foot drop. I could bask in the partnership of light and shadow. They danced continuously, as if to tell me that life needs both, literally and figuratively. Yes, I am back home now and have been for almost a month. But the Canyon hasn’t left me, and hopefully it never will.